On October 6, 2013, a transit enthusiast group known as the Toronto Transportation Society, ran a fan trip using TTC PCC streetcar 4500. 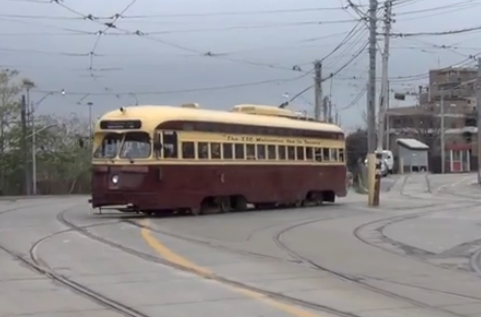 The fan trip was to commemorate the 75th Anniversary since the introduction of the PCC streetcar in Toronto. TTC PCC streetcar 4500 in Toronto, Ontario, Canada. Toronto Transit Commission (TTC) is thanking residents and businesses for their patience during the Kingston Rd. streetcar track construction last year by giving people FREE rides on their vintage PCC streetcar along Kingston Rd. on Sunday, March 30 from noon to 4 p.m. between Woodbine Loop and Bingham Loop (from Kingston Rd. eastbound, all streetcars turn onto Victoria Park Ave. northbound, turn west to enter this loop, and exit onto Bingham southbound to return to Kingston Rd. westbound). President’s Conference Committee streetcars, better known to Torontonians as the PCCs or Red Rockets. PCCs were a popular sight in Toronto from 1938 to 1995. At one time, Toronto owned the largest fleet of PCCs in the world – 745 cars. Two cars remain in the TTC fleet and are available for charters. Also, adjustments to TTC routes and schedules are effective Sunday, March 30, 2014. Please click here for info regarding periodic adjustments to routes and schedules. To thank residents and businesses for their patience during the Kingston Rd. streetcar track construction last year, people can ride for free the TTC’s vintage PCC streetcar along Kingston Rd. on Sunday, March 30 from noon to 4 p.m. between Woodbine and Bingham Loops. Ward 32 Beaches-East York Councillor Mary-Margaret McMahon, TTC Vice-Chair Maureen Adamson and TTC Chief Customer Officer Chris Upfold will be riding the PCC from noon till 2 p.m. Come by and say hello. PCCs were the backbone of the TTC streetcar fleet for many decades, and were a popular sight in Toronto from 1938 to 1995. At one time, Toronto owned the largest fleet of PCCs in the world – 745 cars.